Plone Migration Service: migrate content from any static websites, websites based on other CMSs, or old Plone versions to any of Plone latest releases. Quintagroup provides Plone Migration Services that allow to migrate content from any static websites, websites based on other Content Management System(s), or old Plone versions to any of Plone latest releases. In any case, there is a need to migrate the content from the old site to the new site. This is not a simple process. A change in technology platforms makes the content migration challenging, as does a major restructure or redesign of the site. Websites and intranets can consist of thousands, or tens thousands or even hundreds thousands of pages. Migrating this number of content to a new format is a huge task. Quintagroup offers cost-effective Plone migration services to migrate your website content to a new presentation quickly and with high accuracy. Quintagroup Plone migration services enable you to safely migrate all structured and unstructured content, plus applications and infrastructures that support it. Our services provide Plone migration process that include metadata, keywords, permissions, states etc. migration from the existing production to the Plone environment. The key aspect of any successful migration process is to select the most suitable migration method that will allow to keep site weight for search engines and keep connections between site content valid. Quintagroup has a number of tools at our disposal that allows us to make Plone migration process successful in every respect. When it goes about content migration between two Plone sites of different versions, we often use quintagroup.transmogrifier package for exporting/importing content from/to Plone site. The general idea about completing Plone migration is to track old site content pages (their URLs) that are supposed to be migrated into Plone. Then prepare a list of URLs on a new site that content will be transferred to. 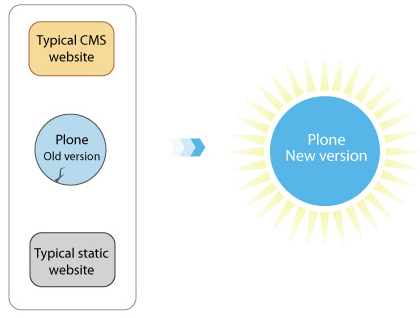 The simplest and the most reliable method to carry out Plone migration is to export content from the initial database in .csv files, then process it to fit new website and, finally, import content to the new website. But this approach is not always working. In some cases we use custom tools for grabbing content from the old website. Then the content is arranged in such a way that a structure of a new Plone-based site is generated. While adapting all content for the new Plone-based website, special attention is paid to correct work of links - both internal and external. During Plone migration we do our best to keep connections between site content. If broken internal links are found - they are fixed and can be replaced with resolveUIDs, which enables us to manipulate with the content and to move it within the site without its interconnection loose. As a result of a successful Plone migration, new Plone site not only includes all content from old site, but remains friendly for search engines. With our Plone migration services you can be sure that your new site SEO properties will be taken care of. We can keep the same links (URLs) that were on the old static website if they were good from SEO point of view. In case old site links (URLs) were not good for search engines, we would recommend to create new: concise, descriptive, and readable. This might sound frightening from SEO point of view. But for all those manipulations we can use permanent redirect from old bad URLs to new ones. As a result your site URLs become friendlier for search engines and you keep weight that your site has gained since its launching. You do not loose, you even get more site visitors that come from Google or any other search engine. While Plone migrating you can also think about site reconstruction, i.e. we can change site structure by creating site sections, subsections etc. for better content distribution. If during your site content migration to Plone, you also desire to find a new Plone hosting provider, please consider Quintagroup Plone/Zope hosting services and contact us for more information.